Your face tells you a lot about your age. Your face shape, along with the appearance of your skin, can make you look younger or older than you really are. Women with V-shaped faces are often seen as more youthful due to the slim lower face, defined jawline, and sharp chin. Unfortunately, aging and gravity can cause your facial shape to have a “dropping” appearance as your nasolabial becomes more prominent and jawline loose definition. But thanks to modern day technology, we now have non-surgical “lifting procedures” that can tighten and firm our facial features. The Dr. Perfect V-Line PDO Thread Lift combined with Dermal Fillers are a specifically designed combination treatment to help lift the face to reverse aging skin and create that ideal V-shape. Here is a closer look at PDO threads and Dermal Fillers. What is the Dr. Perfect V-Line PDO Thread Lift and Dermal Fillers? At the Cutis Laser Clinics in Singapore, we have added the Dr. Perfect V-Line thread lift to our Cutis Lift to help combat the signs of aging. This innovative and KFDA-cleared skin tightening technique for saggy skin uses absorbable polydioxanone (PDO) threads that helps restore a natural face balance using a combination of PDO threads and dermal fillers. Dr. Perfect V-Line is useful for nearly all areas of the face, such as sagging necks and loose cheeks or jowls. On the other hand, Dermal Fillers are injectable gels that are used to “fill” areas of the face that have lost volume such as the cheeks to lift the face. It can also be used to add volume to the chin which also helps to give you a V-shape facial contour. The most common type of fillers are made from hyaluronic acid and calcium, these substances are also naturally found in our bodies making it safe. What Are the Advantages of Dr. Perfect V-Line and Dermal Fillers? There are many advantages of Dr. Perfect V-Line compared to other threads. First, there is a wider range of thread options designed to address different concerns. 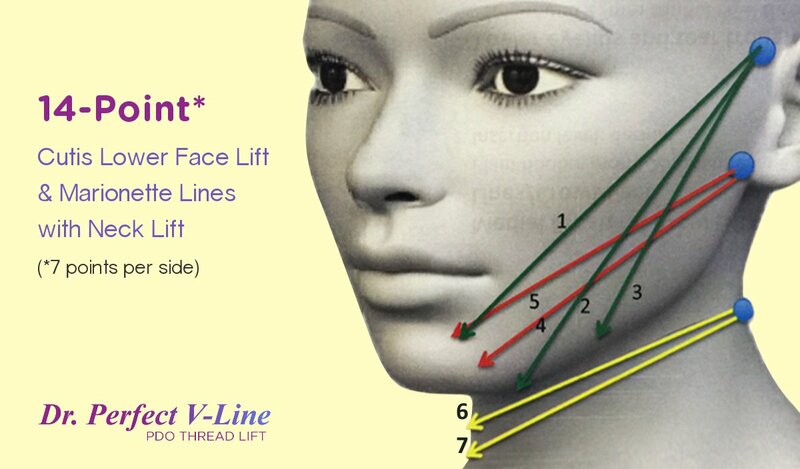 For example, ultra-thin mono threads are great for collagen building and rejuvenation for the cheeks and lower chin. While thicker, bi-directional 360 degree cog threads can be used to achieve a stronger lifting effect on sagging cheeks and jawline. Another advantage of Dr. Perfect V-Line is that there is no downtime and the results are noticeable after the treatment. Similarly, dermal fillers can also treat multiple areas on the face without surgery. Besides from filling in sunken cheeks, it can also be used to reduce fine lines and add volume to the chin, nose and even the lips giving a natural look. The results can be also seen immediately and can last at least 12 months or more depending on the type of fillers used. Quick Tip: Remember, the advantages and results of these procedures will depend on the skills and experience of your aesthetic doctor in Singapore. Make sure that your injector completed master class trainings of the procedures with a proven track records of providing natural results. How Is Dr. Perfect V-Line and Dermal Fillers Performed? During treatment, the PDO threads are inserted into the subcutaneous layer (fat layer) or the superficial muscular aponeurotic system (SMAS) under the skin. The threads will be inserted using a cannula which reduces bruising on the area that needs to be treated. But if the neck area is not a concern, then you may consider a 10-Point Lift (minus the 4 points for the neck). Rest assured that our aesthetic doctor will discuss a suitable treatment plan based on your concerns during your consultation. Within six to eight months following the treatment, the threads are naturally absorbed and collagen will start to form around the threads. The results of Dr. Perfect V-Line can last up to two years. On the other hand, Dermal Fillers are introduced into specific positions in the face using very fine needles. So fillers can be used to re-create cheekbones, sharpen the nose and enhance your profile as well as provide a subtle, soft enhancement on the lips. Numbing cream will also be applied to the area before the procedure in order to make the treatment more comfortable. Dr. Perfect V-Line skin tightening treatments and Dermal Fillers may take at least 60 minutes to complete. The length of the procedure will depend on the area being treated and how many PDO threads or syringe of fillers are needed. As with any injection, there may be some mild redness, swelling or soreness at the treatment site for about 1 to 2 days. There is also a potential for temporary bruising, which can be reduced with continued ice compress immediately after the treatment. Quick tip: Avoid taking Fish oil, Vitamin E, any anti-inflammatory drugs for 10-14 days before your treatment to minimize the risk of bruising. 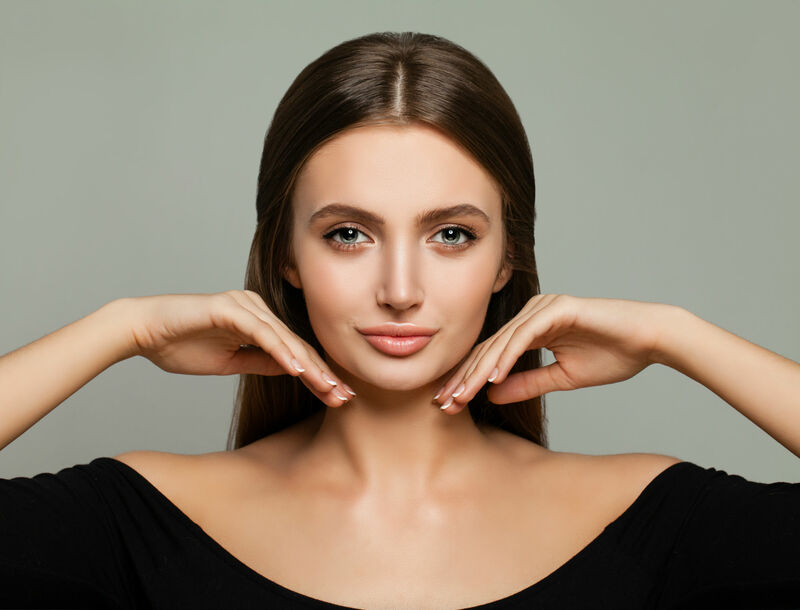 To know if you are a good candidate for these procedures or to learn more about skin tightening in Singapore, contact Cutis Laser Clinics today and schedule a consultation with our aesthetic doctor, Dr. Sylvia Ramirez.